La Jolla Cove is scenic perfection. It has a relatively small beach area, but is so picturesque, it is the most photographed of all San Diego area beaches. The romantic and tranquil setting lies between sandstone cliffs that feature mind-blowing views across the Pacific Ocean. Hand around until the sun begins to drop below the western horizon and be rewarded with some of the magnificent sunsets you'll ever experience. 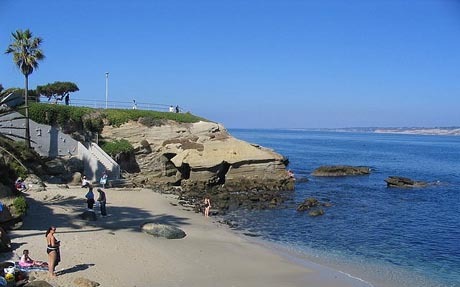 La Jolla Cove is very popular with snorkeling and scuba-diving enthusiasts. That's because it is located within the San Diego-La Jolla Underwater Park, a protected marine refuge area. Not only is marine life protected, La Jolla Cove enjoys clear waters often featuring up to 30 feet of visibility. Surfing, boogie boards, inflatable water mattresses and fishing are prohibited which creates the ideal conditions for snorkeling and diving. The Cove sets right below La Jolla Village, one of the most unique shopping areas on the coast. On Prospect Street you will find places that rent snorkeling equipment. Find a comfortable spot on the beach, layout a beach towel, slip into your gear and begin your underwater sightseeing adventure. Always ask the lifeguard about diving conditions and areas to avoid for your safety. Once you’ve swam a few feet out into the ocean, a magical undersea world will unfold in front of you. The aquatic and plant life is absolutely stunning. Brightly colored Garibaldi and small fish can be seen in abundance. Sea grasses sway gently in the current, tall forests of kelp beds can be seen below. Anemones wait patiently for their next meal while harmless shark species and the odd seal can be seen making their way through the Cove. For those with physical challenges, it is a beautiful beach where you can people watch, sunbathe, read, and absorb breathtaking views. Picture post card scenes are abundant for photo-taking opportunities. The stretch of beach between the Cove and Children’s Pool is magnificent. You’ll see brightly colored native and cultivated flowers, open grassy areas on the towering bluff and a variety of other awesome sights. La Jolla Cove was crafted by nature for romantics. Take someone special for a stroll along the beach at sunset. Hold hands and sneak a kiss in this romantic place just right for falling in-love or celebrating a honeymoon. Spread a blanket at the adjacent grassy Scripps Park and have a picnic. Or if you prefer, walk to La Jolla Village, Enjoy shopping, visit the museums, have dinner overlooking the ocean or take-in the active nightlife. If you are in the La Jolla, California area be sure to set aside some time to spend at La Jolla Cove. It’s an experience of a lifetime. From the north. Take Interstate 5 to La Jolla Village Drive, westbound. Turn left on Torrey Pines Road at the signalized intersection. Follow Torrey Pines Road to the intersection at Prospect Street and turn right. Watch for the signs and bear right on Coast Boulevard. From the south. Take Interstate 5 north to La Jolla Parkway. Continue on as it becomes Torrey Pines Road. Follow Torrey Pines Road to the intersection at Prospect Street and turn right. Watch for the signs and stay right on Coast Boulevard. Lifeguards are stationed daily year-round until dusk. Public restrooms and showers are available at nearby Scripps Park. There is no disabled access at La Jolla Cove because of the steep incline down to the beach. La Jolla Cove is for swimmers and divers only. There are no parking lots next to the beach, and metered street parking fills up quickly on summer weekends. It’s best to come early, park downtown in one of the paid lots in La Jolla Village which is a short distance from the beach. La Jolla Cove Beach. Best Location For Snorkeling.